"A representative of the Kurganmashzavod company said that there are about 700 BMP-3s in the UAE, 135 of which are being modernized to increase combat capability under a 2013 contract with Russian arms export agency Rosoboronexport. Russia plans to finish upgrading a large portion of its BMP-3 infantry fighting vehicles for the United Arab Emirates by late 2015 to early 2016, the manufacturer announced Friday. "We plan to conclude this work by late this year or early next year," a representative of the Kurganmashzavod company told RIA Novosti. There are about 700 BMP-3s in the UAE, 135 of which are being modernized to increase combat capability under a 2013 contract with Russian arms export agency Rosoboronexport, the representative explained." Thought it might be nice addition. Militarov wrote: "A representative of the Kurganmashzavod company said that there are about 700 BMP-3s in the UAE, 135 of which are being modernized to increase combat capability under a 2013 contract with Russian arms export agency Rosoboronexport. Russia plans to finish upgrading a large portion of its BMP-3 infantry fighting vehicles for the United Arab Emirates by late 2015 to early 2016, the manufacturer announced Friday. "We plan to conclude this work by late this year or early next year," a representative of the Kurganmashzavod company told RIA Novosti. There are about 700 BMP-3s in the UAE, 135 of which are being modernized to increase combat capability under a 2013 contract with Russian arms export agency Rosoboronexport, the representative explained." NIZHNY TAGIL, September 11. /TASS/. The United Arab Emirates will receive several hundred Russian-made AU-220M combat modules for its domestically-produced infantry fighting vehicles, Uralvagonzavod Director General Oleg Siyenko told TASS on Friday. "We have made progress, we have decided on the volume of delivery, and UAE leaders supervise the issue. They and we have a program [to fulfil]; I would not mention the number [of modules to be ordered], but it is hundreds," Siyenko said at the Russia Arms Expo 2015 show. Russian firm Tractor Plants has received acquisition requests from Myanmar and Morocco for 60 BMP-3 amphibious infantry fighting vehicles. "As of today, we have received requests for the acquisition of the BMP-3 from Myanmar and Morocco. I cannot disclose the exact amount, but we are talking about somewhere in the region of two battalions," a representative of the Russian company Tractor Plants was quoted as saying by RIA Novosti today. The anti-infantry vehicles are manufactured by the Kurganmashzavod company, part of the Tractor Plants machine-building consortium. Formal discussions to purchase the BMP-3 had not commenced, the Tractor Plants spokesperson said. But even Myanmar is keen to buy the BMP-3F version, which has been modified for seaworthiness and buoyancy. Tractor Plants is a domestic as well as foreign company exhibiting at the 10th annual Russia Arms Expo RAE-2015 international arms show, underway in the city of Nizhny Tagil. Russia will complete the delivery of another 50 BMP-3 armored infantry vehicles to Azerbaijan in 2016, military sources told TASS news agency. Earlier this year, it became know that Russia is going to complete the sale of T-90S tanks to Azerbaijan, sources said. “Earlier Rosoboronexport also stated that in 2014 Russia will finalize delivery of a large batch of weapons and equipment for the contracts signed in 2010”. According to Russian media reports, Azerbaijan purchased from Russia T-90S tanks, BMP-3 armored infantry vehicles (about 100 vehicles), multiple rocket launchers and heavy flamethrower systems. Experts say the signed contracts amounted to approximately one billion US dollars. Топливные баки размещены на корме. А поскольку в "Концерн "Тракторные заводы" также входит НИИстали, организация которая помимо всего также занимается разработкой взрывобезопасных топливных баков с самозатягивающимся покрытием, то за пожарную безопасность изделия можно не беспокоиться. The fuel tanks are located in the stern. And since "Concern" Tractor plants "also includes NIIstali organization which among other also developing explosion-proof fuel tank with self-coating, the products for fire safety can not worry. 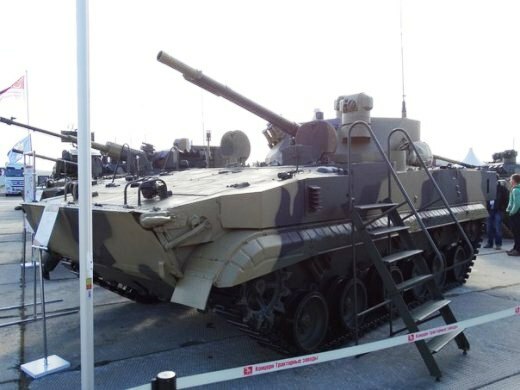 In Russia, created by high-explosive shells "Cherry-1"
The latest version of Russia’s BMP-3 Dragun armored vehicle became a major attention grabber at the Russia Arms Expo which has just wrapped up in Nizhny Tagil. A heavily updated version of its BMP-3 predecessor, the BMP-3M Dragun AFV features an uninhabited combat module with a front-loaded engine. The combat module, isolated from the crew and troop compartment, features a 2A70 100 mm rifled gun, which can fire conventional shells or guided missiles, a 2A72 30 mm dual feed autocannon, which can fire 300 rounds per minute, and a 7.62mm machine gun that can fire up to 800 rounds per minute, mounted coaxially with the cannon. Such an arrangement ensures maximum protection for the crew and troopers against a direct hit by armor-piercing shells. In another first, the three-man crew is moved to the front immediately behind the engine unit, each with their own escape hatch. The fire control system effectively engages ground and airborne targets both on the move and from static positions. It consists of a SOZH-M gunner's main sight with an integrated laser range-finder and missile-guidance channel, a Vesna-K targeting system with a thermal imaging camera and automatic target tracker, an armament stabilization system, a ballistic computer with data input sensors and a laser projector. The BMP-3M is powered by a multi-fuel diesel four-stroke, liquid-cooled turbo diesel engine packing over 800 horse power. This allows the 21-ton vehicle to move at 70 kilometers per hour on a highway and up to 10 kilometers per hour in water. The BMP-3M is designed and produced by the Kurgamashzavod (Kurgan Machine Building Plant). In May 2015, the Russian Defense Ministry signed a three-year contract to receive hundreds of BMP-3M vehicles to maintain its armored vehicle force until its replacement, the Kurganets-25, completes research and development. During seaworthiness testing of the BMP-3 in 1985 off the coast of Sevastopol, the BMP-3 demonstrated the ability to fire accurately while afloat. With a T-55 (which was pulled out of storage) as a target, the 30mm autocannon, firing HE shells, managed to completely destroy all exterior sighting systems from a distance of 1500m. When fired at with the 100mm HEF shells, close inspection revealed that the 100mm gun of the T-55 was broken in four places, and the hull front plate was fractured, with cracks running along it in several places. Such a demonstration provides a good justification for the belief that a 100mm HEF round would be absolutely lethal even to most of the late Cold War era IFVs, which have far less protection. KBP of Tula (the manufacturers of the 2A70 gun and its ammunition) seems to think so too. In a promo video showcasing the BMP-3M, they state that the 100mm HEF shell fired from a BMP-3 could destroy a lightly armoured vehicle with great certainty with the first shot, or with an absolute guarantee on the second shot. The 3UBR8 shell is capable of defeating most modern IFVs, but with varying effectiveness. Older IFVs like the M2A2 Bradley, Warrior, Marder 1A3, and the like can be easily eliminated at extended ranges - which is up to 2000m and beyond. Newer models like the CV90 series and Puma are most likely fully immune and would require shots from the 100mm gun to destroy. The BMP-3 employs spaced bimetallic armour with an integrated liquid medium package, which is a fancy way of saying that it has aluminium armour augmented with a spaced hard steel wave breaker, backed by a specially designed fuel tank which also acts as armour. Baseline BMP-3s are stated to have sufficient armour to resist 30mm shells frontally from a distance of 200m. Overall, the BMP-3 offers 1.7 times better protection from small arms fire when compared to the BMP-1, and much greater protection against HEAT warheads frontally. The addition of steel overlays over the roof of the hull and turret grants the vehicle complete protection from airbursting 155mm artillery shells. There is a composite armour enhancement kit available for the BMP-3, which is mounted over the upper sides of the hull. The degree of protection offered by the kit is unknown, but it should boost the effectiveness of the side profile from 25mm APDS shells at closer ranges. The kit compensates for its own weight by including air pockets in the design, acting both as spacing and as floatation aids. The BMP-3's amphibious qualities are therefore completely unaffected. They probably have only a single chassis available. Obviously the turret is compatible with the BMP-3's turret ring, so any vehicle that has been modified to use the 100/30 turret could also use the 57mm turret. Russian MOD wants to put Epoch turrets on everything lol! Someone please photoshop a Epoch turret on top of a Epoch turret lmao! Well they have standardised their entire range of armoured vehicles into four main families... it would be silly to make a different turret for each type in each family. The Epoch turret is intended for all vehicle families in the APC role.... the tank turret will also be standardised across the vehicle families for the tank/gun platform role too... same weapon, same sensors, same systems. No point in reinventing the wheel. Iraq and Saudi Arabia have expressed interest in ordering large numbers of BMP-3 infantry fighting vehicles (IFVs), according to Albert Bakov, the vice-president and co-owner of the Tractor Plants Concern, which controls Kurganmashzavod, the company that produces the IFVs. "We've got a request for 500 BMP-3s from Iraq and for 950 vehicles from Saudi Arabia," he told the TASS news agency on 30 September. In terms of tracked IFVs, Saudi Arabia currently has around 400 Bradley M2/M3s, while Iraq has a small number of BMP-1s and BMP-2s. Rosboronexport, Russia's arms export agency, has no information about Iraqi or Saudi BMP-3 orders, its spokesman Vyacheslav Davidenko told the Interfax-AVN news agency later the same day. It is possible the Tractor Plants Concern has the authority to line up export orders independently of Rosboronexport. 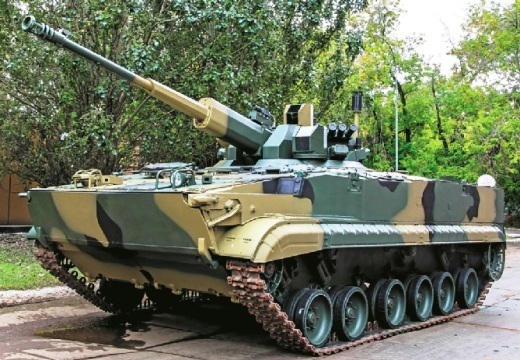 Bakov suggested the BMP-3 production line is currently closed, even though vehicles were delivered to Azerbaijan and Indonesia in 2014, but would be restarted next year. "In 2016 we will launch an assembly line in time to fulfil all the orders, but the launch of the assembly line requires a lot of work relating to the supply of components," he said. TASS noted earlier reports that 200 additional BMP-3s have been ordered for the Russian army and are expected to be delivered before the end of 2017. A new version of the BMP-3 is being developed called the Dragoon that rectifies the vehicle's most glaring flaw by moving the engine to the front, thereby freeing up more space for the infantry in the rear. The Dragoon also has the new AU-220M weapon station with a 57 mm gun. 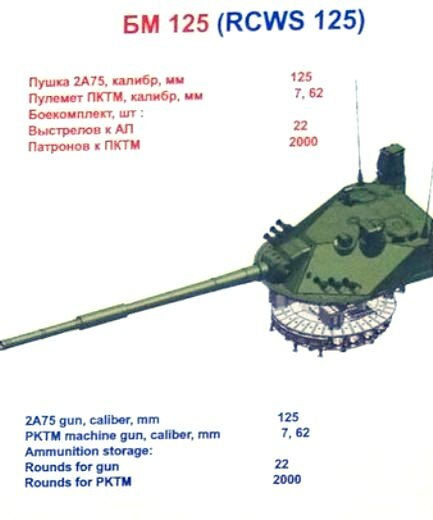 Brakov indicated that any BMP-3s that will be built for Russia or export customers will be the original version, which has an extremely cramped infantry compartment and a two-man turret with coaxial 100 mm and 30 mm guns, when he said his company was still waiting for a contract from the Russian Ministry of Defence to develop the Dragoon further. Does the new BMP-3 with Epoch Turet ( 30 mm Gun and ATGM ) and BMP-3 with 57 mm cannon have moved their engine on their front instead of original BMP-3 with rear engine. Austin wrote: Does the new BMP-3 with Epoch Turet ( 30 mm Gun and ATGM ) and BMP-3 with 57 mm cannon have moved their engine on their front instead of original BMP-3 with rear engine. Among the 3 vehicles shown recently, Dragun with its unmanned 100 mm + 30 mm turret is front-engined. 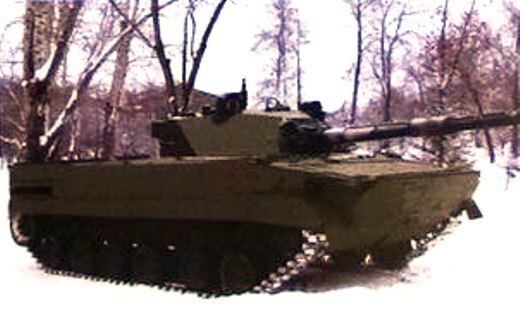 The Derivatsiya, with its "57 mm" unmanned turret, and the robot, with an Epokha turret, are rear-engined.